Well-rehearsed debates in feminist theory and epistemology between modern, structural approaches to understanding gender inequalities and the post-structural disruption of the category ‘woman’ are increasingly being played out in the arena of social policy. In social policy, unlike many other disciplines, a strata of academics, researchers, politicians and policymakers are actively and intimately bound up with the workings of the state. From a pluralist perspective, the policy world is a competitive forum, where different interest groups vie for position. The role of social policy actors is to shape the policy agenda in their particular interests and their task is to network, build alliances and enter the arena of the opposition or government policy development process. This is a ‘real’ world, where power is vital, palpable, visible and deeply embedded in aspects of the social policy psyche. In the last few years, post-structural approaches have challenged this scenario, destabilizing the theoretical frameworks and processes of policy development, offering a critical alternative to understanding the discourse and effects of social policy agendas. The stumbling block is that they seem to undermine and constrain the possibility of action and social change, which are the driving imperatives of policy development. These two books reflect the tensions between the two approaches. Nickie Charles charts the influence of second wave feminism on social policy. Gail Lewis shifts the focus to the involvement of welfare institutions and practices in the constitution and government of new welfare subjects. At the centre of Nickie Charles’ analysis is the paradox, which continues to frame and to thwart feminist politics. As she suggests, it arises from the practical reality that the capacity of feminist social movements to influence policy agendas is in the gift of a resistant state that supports and maintains the social relations that feminists work to transform. The impact of social movements on policy will always be the outcome of negotiation, between social interests and a powerful state. 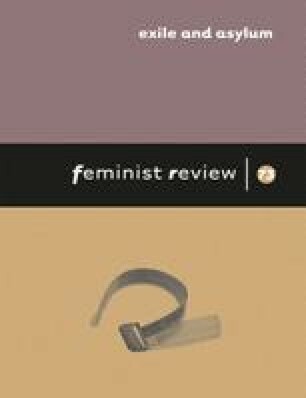 Through an analysis of key policy areas for feminism: equal opportunities, poverty, abortion, violence and family policy, she celebrates the impact of feminism on policy-making, but also identifies the subtle ways that radical feminist goals have been, and are, transformed by state systems. Charles suggests that in a pluralistic state, feminist social movements are able to influence policy-making through an intricate combination of cultural and political/structural factors. She explores European new social movement theories to trace how feminist social movements have worked to dismantle cultural barriers to change by creating alternative ways of living in and understanding the world. Engaging with ‘resource mobilisation theories’ in the US, the author focuses on the institutional context of feminist politics, how individual feminists have gained access to party and government elites through political networks and alliances. In Britain and the US, second-wave feminists made strategic decisions to work within the system where they felt they had more chance of changing political attitudes and policy frameworks. A critical presence of women needed to exist inside political institutions for change to be imperative. In British politics, feminists who influenced policy development in the National Council for Civil Liberties, Child Poverty Action Group, the Institute for Public Policy Research and the Commission for Social Justice, have now moved closer to the Labour party, becoming influential in government and government agencies. In the United States, Charles argues, feminists had an even greater impact on policy due to their direct assimilation into political structures by creating feminist policy networks like the Centre for Women's Policy Studies, Institute for Women's Policy Research. In this process of assimilation, the original goals of feminist social movements are redefined and diluted to fit in with mainstream policy paradigms. Dependent on and constrained by the system in which they operate, feminist political agency is always limited. Over the last 20 years or so, many of the arguments and politics of second-wave feminism have become incorporated into mainstream policy agenda. The issue of gender equality, for example, as Nickie Charles points out, has become part of and accommodated within a liberal democratic framework; equal opportunity has been redefined according to government perspectives and the capacity for organizations to adapt rather than change. Similarly, policies developed by feminists on the Commission for Social Justice to ease the contradictory relationship for women between work and family, and to encourage men to share domestic responsibilities, have been absorbed into government policy, and translated into policies that will ‘strengthen families and communities’. If the goals of second-wave feminism were to make visible and transform gender relations, the effect of engagement in political institutions has been to dilute this goal so that it fits within the prevailing political discourse. Feminists close to government now seem to have a key role in preserving rather than undermining unequal relations of power necessary to maintaining the status quo. For Gail Lewis, this cultural/material framework for understanding feminist politics is a distraction, since it presumes that power is systemic and that subjects have the capacity to engage with and alter those power relations. Economic and sociological interpretations fail, she argues, to account for the ways that power flows through socially constructed forms of knowledge, to constitute new black welfare subjects and racialized populations. The author sets out to disrupt the grand narratives, which have shaped mainstream and critical approaches to social policy, shifting the focus from strategies that may challenge the hegemonic power of institutions, to the power/knowledge dynamic in social policy practices. From a Foucauldian perspective, Lewis explores the relationship between ‘race’, gender and welfare, focusing on a critical moment in the 1980s, when there was a significant rise in the number of black and Asian women in professional grades of social work. She finds that a complexity of occurrences coincide to produce new discourses of ‘race’ and gender, which operate to reconstitute former ‘immigrant’ populations into ‘ethnic minorities’. In this process, black and Asian families are identified as pathological and open to state intervention. Since the specialist knowledge required to ‘care’ for these families was seen to lie with black and Asian women, this opened up employment opportunities in the professional field of social work. A virtuous circle, further legitimized by the values of municipal socialism, the politics of equality and equal opportunities. Gail Lewis opens up hidden spaces which lie in and between traditional social policy frameworks, spaces that second-wave feminism, which emerged in specific social and political conditions, did not encounter. Anne Oakley's radical statement in 1974 that ‘women do housework’ would be now deeply contested by black feminisms and post-structural analyses (Oakley, 1974). The perennial social policy question as to how such an analysis could be translated into policy frameworks is unanswerable. For political movements to have an impact, it helps to be able to visualize and define activity and to plot the progress of change. Second-wave feminism was visible, had a distinct shape, could be logically fitted into existing theoretical spaces and could be monitored as it effected cultural and political worlds. By thinking and acting differently in their everyday lives and by engaging strategically in the political and policy world, feminists did challenge traditional views about a woman's role in society and her capacity for autonomy and independence. They did put child care, violence and abortion on to the policy agenda; they did stand up against the odds and fight for women's rights and equality. Discursive political encounters operate in the shadows, are diffuse, dispersed, have no clear goals or sense of strategic progress. They do not fit the mould, are subversive and anathema to social policymakers, since they challenge every common sense understanding as to how and why policies are made. The critical impact of Gail Lewis’ book in policy terms is that it unsettles and disrupts common sense assumptions that have condensed around ‘race’ and gender politics in the policy arena. She implicitly calls into question the singularity and authenticity of the political subject of second-wave feminism, and thereby her capacity to transform the social world; recognizing at the same time that engagement with a resistant state ties welfare subjects into the discourses which operate to maintain strategic power relations. Inevitably, the rug is pulled out from beneath second-wave feminism, forcing the question first, as to whether feminist politics has any firm ground to stand on at all, and second, what would a new feminist politics possibly look like. What is clear from these two books is that power operates in complex ways to constrain, limit and transform the lives and political capacity of women, and therefore any new feminist politics has to develop an acute and critical sense of that power. Both authors contribute to an understanding of how power relations and forms of knowledge operate in and around the development of social policy. From their separate accounts we can picture a policy environment in which power functions predictably in networks, systems and institutions; and flows contingently through discourses, knowledges and social relations. While it seems, from a social policy perspective, that the two are mutually exclusive, feminists need to engage strategically with both to redefine the political, so as to shift and disperse those relations of power, in whichever ways they work.